I do my best not to pass judgment on anything before giving it a try. I may have jumped the gun once or twice, but whenever possible I form my own opinion. The other day I posted an item about ramps and fiddlehead ferns. Despite having just read a piece in the Times about how ramps aren’t that good, I wanted to try them and see for myself just how weedy they tasted. So this morning I dragged myself out of the apartment at 9:30 and walked three blocks to the Union Square Greenmarket. Ramps were everywhere for $2.50 or $3 per bunch. Sabena reports that Garden of Eden is selling them for $20 per pound, so this is rather a steal if you’re fond of ramps. 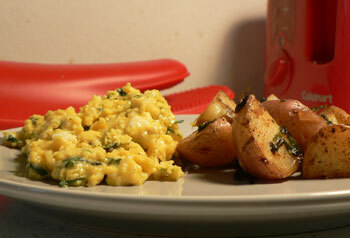 We hadn’t eaten breakfast yet, so I made slow-scrambled eggs and pan-roasted potatoes, both with a heavy dose of ramps. I wasn’t quite sure what to do with the ramps themselves. I knew they were edible from top to bottom, so I washed them thoroughly and chopped them up. For the scrambled eggs, I sautéed the ramps in butter for a few minutes first, then I added the eggs. I did the opposite with the potatoes. Ramps have a peculiar flavor, one that I can still taste an hour after breakfast. Weeds came to mind at the table, but Nathan reminded me that I have never eaten weeds. There is something distinctly grassy and funky about these things, though. I taste onion, but none of onion’s sweetness. In any case, it’s probably not something I’ll buy again without having a recipe recommended to me. I’m certainly not running back to the market to get another bunch before they’re all gone. I might treat these more like leeks, that is, stew them for a long time in butter to bring out their sweetness, rather than a brief sautée. Weren’t there some recipes with the Times article? Were they any help in terms of technique? Hmm, I actually didn’t look at the recipes! I saw that one was a salad and one a soup, so I didn’t bother. I’ll stew the leftover ramps for longer, maybe, although I can still taste the first round in the back of my mouth and I’m reluctant to give them another go. i feel like i could be intruding here, but i am a big fan of ramps…if you blanch (1 minute) and shock them, it removes much of the bitterness and some of the pungency. 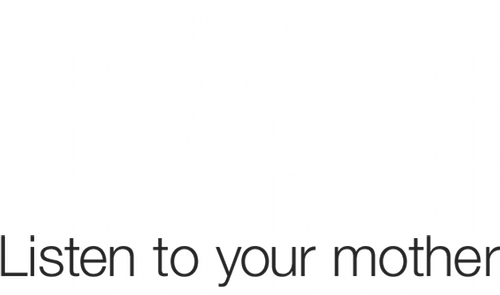 then you can saute, stew, what-have-you…they definitely are not timid greens, but worth giving another chance. Ramps in scrambled eggs would have been fine with plain potatoes or herbed potatoes. However, ramps in both dishes? Not a good idea when making a menu. Thanks, Kat. You’re not intruding at all—that’s good advice! I think you have to be from West Virginia to truly enjoy ramps. I often hear people around here raving about them.